After the publication of On the Origin of Species, Variation of Animals and Plants Under Domestication, The Descent of Man, and The Expression of the Emotions in Man and Animals in the late 1850s through the early 1870s, Charles Darwin published a series of less synthetic, smaller works that were on specific subjects and intended to focus on particular problems. It is in these works that we can most clearly see Darwin as an experimentalist, rather than as a theoretician or a synthetic thinker. One of these works, On the Movements and Habits of Climbing Plants, shows the keen interest Darwin took in experimental methods and botanic research. In his autobiography Darwin reflected on the publication journey of his climbing plants monograph: "In the autumn of 1864 I finished a long paper on Climbing Plants, and sent it to the Linnean Society. The writing of this paper cost me four months: but I was so unwell when I received the proof-­sheets that I was forced to leave them very badly and often obscurely expressed. The paper was little noticed, but when in 1875 it was corrected and published as a separate book it sold well. I was led to take up this subject by reading a short paper by Asa Gray, published in 1858, on the movements of the tendrils of a Cucurbitacean plant." Darwin, Charles. On the Movements and Habits of Climbing Plants, Chapter 1. Gray, Asa. "Note on the Coiling of Tendrils". Proceedings of the American Academy of Arts and Sciences, Vol. 4 (May 1857-May 1860). Darwin writes to his good friend T. H. Huxley, zoologist and one of Darwin’s most ardent defenders, about his transition from books on large concepts to “easier and special” subjects. It is interesting to speculate as to why Darwin believed this was a wise course of action. Asa Gray writes to Darwin that he is in agreement about the mechanism by which tendrils from climbing plants begin to spiral after clasping an object. He discusses the possibilities for how the stimulus travels in the plant. The rest of the letter is filled with news of Gray’s trip to the Western United States with his wife. Darwin writes to Alphonse de Candolle, a Swiss botanist, lawyer and politician, to thank him for sending a copy of his book Histoire des sciences. Darwin sends de Candolle a copy of The Expression of the Emotions in Man and Animals. Darwin writes of his weak health, noting that it makes him dread grappling with the "fearful subject of variation" in nature. As a result, Darwin explains that he is working on some observations in botanical physiology that he plans to publish with his old papers on climbing plants. Asa Gray writes to Darwin with news of his wife, but also to suggest an experimental procedure for Darwin to try on the coiling of tendrils of climbing plants. He thanks Darwin for the copy of Darwin’s new book, The Expression of the Emotions in Man and Animals. 1. What is it about climbing plants that fascinates Darwin? Why do you think he was drawn to this type of study? 2. What kind of experimental information is exchanged between Darwin and Asa Gray? Do you think Darwin was influenced to do botanical work through his relationship with Gray? 3. How does Darwin explain his move to a smaller-scale study to T. H. Huxley? Why do you think Darwin became interested in a smaller, empirical work? To learn about Darwin’s work on climbing plants, the class took a field trip to the Arnold Arboretum. At the Arboretum, students were able to observe the various methods of climbing used by plants. Climbing has a few key evolutionary benefits for plants. Firstly, it saves plants energy: rather than developing their own support systems, climbing plants rely upon their surroundings for support. This saved energy enables climbing plants to devote more energy to leaf development and rapid growth. Climbing plants are also able to grow above other plants, thereby enabling them to reach sunlight in crowded areas. 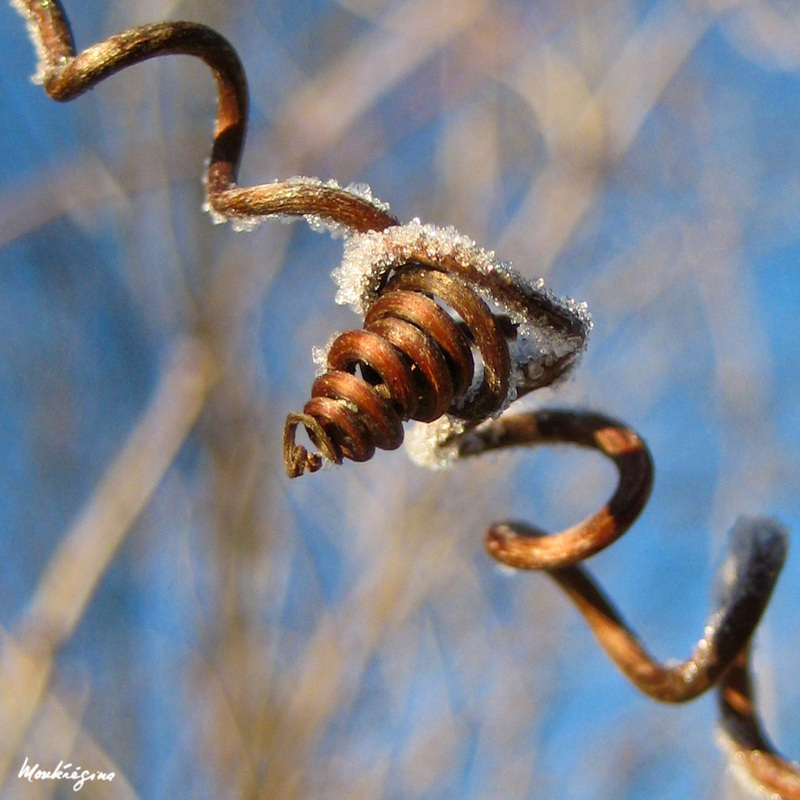 This may be common phenomenon for what I know; but it confounded me quite when I began to observe the irritability of the tendrils.— I do not say it is final cause, but the result is pretty for the plant every 11⁄2 or 2 hours sweeps a circle, (according to length of bending shoot & length of tendril) of from 1 foot to 20 inches in diameter, & immediately that the tendril touches any object its sensitiveness causes it immediately to seize it. For added drama, create a time lapsed video of the cucurbitaceous tendril as it twirls towards the coffee stick. A sample video is available here.